Joyce Walker has dedicated many hours to cultural, charitable and religious causes. A descendant of early Connecticut settlers, Joyce was raised in a family where church and community involvement had long been an expected part of life. She began early. Elected president of the Connecticut State Pilgrim Fellowship during her high school years, she took part in numerous state panel discussions to promote missionary interests among young people. As a young wife, she was active in her church and in the Junior League, supporting community projects in Westchester County, New York, and in Fort Lauderdale when she moved to Florida. She is a long-time supporter of The Opera Society. Joyce received her BA in Art History at Connecticut College for Women in New London, Connecticut, where she met her husband during a summer session they both attended. Jim had returned to Amherst College after completing his service in the Army Air Force in which he participated in D-Day. They were married that October and there followed many weekend trips between Connecticut College and Amherst. Joyce graduated with honors and was awarded the Achison Prize in Biblical Literature. After graduation, they settled in Pelham Manor, New York, where their three children, Beverly, Carol and Douglas were born. Jim entered the publishing business in New York City and soon became known for his successful national promotions. He played an active role in assisting Eleanor Roosevelt in founding the American Association for the United Nations (AAUN), formed to promote public support for the United Nations. Lured by sunny vacations in Florida, they moved to Broward County in 1964. 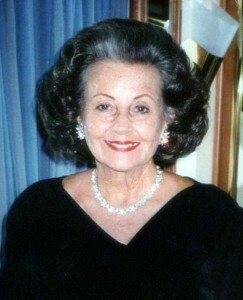 Joyce transferred her Junior League membership and became active in the Fort Lauderdale Museum of Art, producing its monthly bulletins. The training she received led to a professional career including editor of Herald Publications, Quinn Publications, and for 15 years managing editor and later associate publisher of Gold Coast Life magazine. During these years, she was active in Second Church of Christ, Scientist, including Chairman of the Board of Directors, Sunday School teacher and for three years First Reader of the church. Joyce has devoted her time and talents to The Opera Society, and other Fort Lauderdale organizations, in producing professional Commemorative Journals which have contributed to the success of numerous fund-raising events. The Opera Society honored her at the 2007 Cultural and Humanitarian Awards Banquet with an Oscar as “Editor par Excellence.” She is also a past Vice President of Publicity for The Opera Society, a member of Friends of the Museum of Art, and a Founder of the Symphony of the Americas Society which honored her as a “Woman of Style and Substance” in 2004. Jim, her wonderful husband of 55 years, passed on six years ago. She delights in times spent with their three children, five grandchildren. . . . and two great-grandchildren, Kelsey (4 yrs.) and Harrison (2 yrs.). “How Jim would have enjoyed them!” she muses.